A driver busted out some dance moves before he was arrested at the end of a police chase Tuesday night on several Southern California freeways. The chase began after a report of an erratic driver in the Agoura Hills area. The California Highway Patrol got in pursuit of the white four-door sedan on the 101 Freeway eastbound. The driver proceeded to take the 405 Freeway northbound, then took the 118 Freeway eastbound. The white car was traveling at slow speeds. 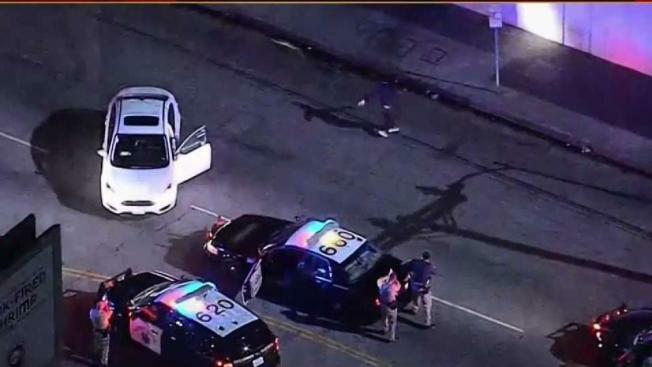 Eventually, police performed a PIT maneuver in the city of Pacoima, and the car came to a stop. The driver got out, then decided to a do a little dance before he was arrested. Witness Jose Suarez said after the arrest that the driver "could have hurt us all" with his erratic driving. "He just started dancing. I mean, just, don't do drugs, that's what I've got to say," Suarez added.